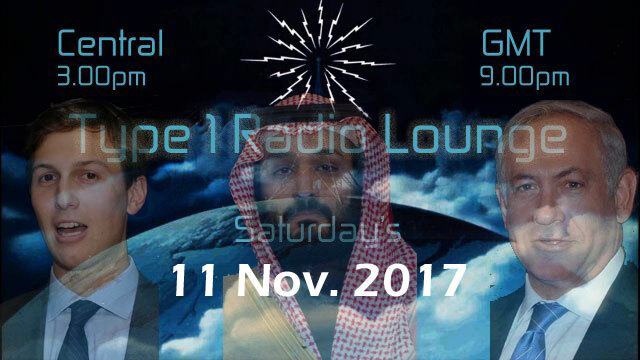 Psonik is back in the driver’s seat for this new episode of Type1Radio Lounge, where he is joined by Swami and Miles. The show opens with discussion of Miles’ recent article on 21st Century Wire on the topic of the resignation of the Lebanese Prime Minister and the Saudi Purge, and what it means for the prospects for a international/regional war involving Iran. We move on to discuss the myriad problems afflicting Theresa May’s government and the future of Brexit and Britain’s relationship with the EU. The conversation touches on the Wikileaks Vault 8 documents and RussiaGate, and the fact that RT America is being forced to register as a foreign agent in the USA. The conversation covers the flood of sexual harassment/assault allegations on both sides of the pond, and we briefly delve into the mind of Kevin Spacey. We end with discussion of an article on the prospect of men becoming pregnant through womb transplants. Music by Green Day.